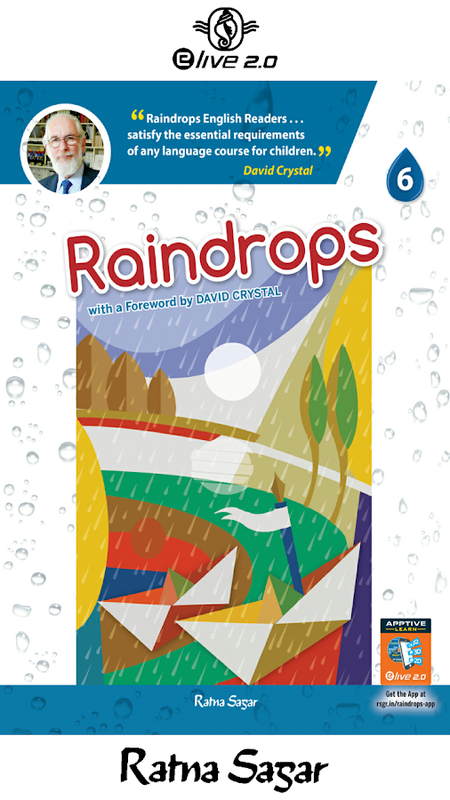 The Raindrops Augmented Reality App gives you an opportunitytotransform your learning process into an exciting 3D journey.TheRaindrops AR App brings topics covered in the lessons tolife,through detailed animated characters and elements that pop uponthe pages. You can use the App to interact with the 3D objectsandtap on them to learn more. With just a single scan, you canwatchan ocean bed come to life, follow a game of cricket and learnaboutamazing mythical creatures from ancient times, and much more!Usethis app for a fun-filled and an enriching augmentedrealityjourney! For the first time Ratna Sagar brings anAugmented Reality App with textbooks. The app will• make language learning a multi-dimensional experience.• provide a convenient way for learners to access content.• help develop skills for the modern world.What's in the app?• This app complements the main course book.• It has animations of 'Story Time' and 'Rhyme Time' pages.• All 'Story Time' and 'Rhyme Time' pages are read aloud.• It aims to enhance the reading and listening skills of thestudents.• It enhances concentration.• It engages the learner in visual communication.Animations capture the attention of learners and help themunderstand ideas/concepts and remember them for a long time. Theapp will hence make learning a fun-filled activity.This app is easy to install and use.How to use the app?1. You will need the book to use the app.2. Open the first page of any lesson/unit/poem which has its nameon it.3. Start the app and focus on the page ensuring that the entirepage can be seen on screen.4. Tap the screen to scan.5. Watch the stories and poems come alive with animation.About the bookPearls is a series of books for Classes LKG, UKG, 1 to 5. Theseries is based on an integrated approach to learning and has beenwritten by experienced teachers.The books have all the features of CCE with• multiple-choice questions• projects and activities with detailed guidelines• subject-specific weblinks• HOTS questions• FAs (two in each semester)• SAs (one in each semester)• value-based activities• life skills• in-text questions and• pre-reading tasksResources for the teacher• Teacher's Companion includes lesson plans, worksheets, answersand more.• e-live integrated eBooks on CD include an enhanced eBook, chapteranimations, interactive exercises, extra pages, audio support andconcept maps. Common English Mistakes or Common Mistakes in English Usage is anapplication created to help the user to avoid common mistakes inEnglish Usage. It will not only shows you common English mistakesbut also improve your confidence while speaking and writing inEnglish. This application is very carefully categorized to helpusers to understand the mistakes easily. This Common EnglishMistakes application include the following categories: ConfusedVerbs Wrong Prepositions Confused Nouns Confused PrepositionsMisuse of Infinitive No Plural Omission_of_Prepositions Translationmistakes Unnecessary the Incorrect Omissions Miscellaneous TipsCommon Spelling Mistakes This common English Mistakes applicationwill definitely help you to avoid common mistakes and speak orwrite English confidently. This application will also help you toin various competitive examinations.